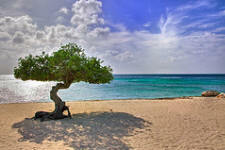 If you're planning your vacation to Aruba and heading straight for its sun-drenched and balmy beaches, watch out! You might turn into a Aruba beach bum. Mind you, there's nothing wrong with being a beach bum - that is, while you're on vacation. Many first time tourists have asked, "how many beaches does Aruba have?" About nineteen. For Aruba's land size - 75 square miles - that's a lot of beach! The locals and tourists can enjoy beach life all year around, 24/7, because Aruba happens to lie OUTSIDE the hurricane belt. Palm Beach - many first class hotels have direct access to Palm Beach, but locals come here either via car, bus or taxi. The Marriott, Hyatt, Westin and Radisson hotels are nearby. The waters of Palm Beach are generally calm and the sand (white powder) is excellent. Eagle Beach - if you're into water sports, Eagle Beach is your best best. The nearest hotels like Manchebo Beach Resort and Spa as well as the Bucuti Beach Resort organize watersports and beach activities for the single traveler or for the whole family. White powder sand and gentle waves are what you can expect from Eagle Beach. You can take your car, bus or a taxi to go there. Baby Beach - snorkeling fans like Baby Beach for its shallow waters. The only disadvantage here is that there are no nearby accommodations, but there are bathrooms and palapas. A palapa is similar to a grass hut, a common sight in most tropical islands. They're made with grass or local sturdy leaves to protect beachcombers from the hot sun; it also serves as a place for outdoor eating. Baby Beach is accessible via car or public transportation. De Palm Island - here's another beach that will make snorkeling fans happy. Described as a gentle surf beach, De Palm Island can be reached via boat excursions managed by De Palm Island. There are no hotels nearby, but you get that great white powder sand which has become one of Aruba's trademarks. De Palm Island has been a favorite spot for group picnics; kids will love the waterpark. Hadicurari - this beach is popular because this is where the windsurfing competition is held each year. Waters are very shallow and a natural spot for windsurfing and swimming fans. This beach also has white powder sand, and some pebbles and stones. No nearby accommodation, but is accessible by car, bus or taxi. Arashi Beach - if you want one Aruba beach that is perfect for hours and hours of just swimming, Arashi Beach offers very calm waters. Take your car because there's plenty of parking, or take a cab or public bus. The bus stops at Malmok and you have a 10-minute walk to Arashi Beach. You also have beach huts and palapas if you want to take a break from the sun and nibble at your lunch. There are no accommodations. Dos Playa - not all of Aruba's beaches offer tranquil waters. Dos Playa Beach wouldn't be the ideal spot for swimming with children. Dos Playa has huge waves and potentially risky currents. But if you want to cleanse your mind and leave the stress behind, Dos Playa will make your picnic (and daydreaming) hard to forget. If you're into staring at wonderful scenery, this beach will deliver. Get to Dos Playa with a 4-wheel drive vehicle. And bring everything you need because there are no accommodations. Renaissance Island - an excellent swimming paradise. It has both a public and private beach, but is only accessible via boat. The Renaissance Aruba Resort & Casino is here and can arrange boat trips for you. Calm waters, white powder sand plus hotel facilities are an added convenience. Boca Grandi - this is the beach that kite and board surfers go to because of the strong currents, so Boca Grandi is not for swimming. There is no public bus that can take you there but you can easily get to it if you have a car or take the taxi. There are no facilities, nor are there any nearby accommodations. If you want to do a full Aruba beach tour, check out these other beaches: Boca Catalina (great for snorkeling), Manchebo (Manchebo Beach Resort is nearby), Andicuri (strong waves and currents), Druif Beach (calm waters, facilities nearby), Surfside Beach, Mangel Halto (shallow waters, great for picnics), Santo Largo, Bachelors Beach (for windsurfing and water sports enthusiasts), Rodgers Beach (calm waters but facilities lacking), and Natural Pool (it's like an outside pool, but waters outside the limits can be risky) plus you'll need a 4-wheel drive - or a horse - to get there. Most people don't realize that little Aruba has so many beaches. Aruba's beaches will make you want to come back to this wonderful island again and again. 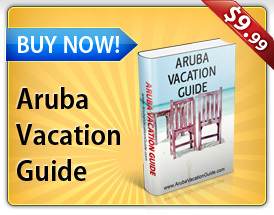 Copryright 2010-2014 © Aruba-Travel.info. All rights reserved.